Click Here To See Marvel Premiere #6 Comic Book! From Frank Brunner's very first Doctor Strange story comes this page from 1972's Marvel Premiere #6. It features Doctor Strange's beloved, Clea and Strange's right-hand man, Wong in an intense battle page against demons. Clea first appeared in 1964's Strange Tales #126. Wong first appeared in the very first Doctor Strange story in 1963's Strange Tales #110. panels 3 and 4 were placed from the back and taped into place and the page looks perfect. This was very common during the early 1970's at Marvel. Frank Brunner's work on Doctor Strange was relatively brief, but it is highly cherished by fans and will forever be remembered due to the high quality of the work. 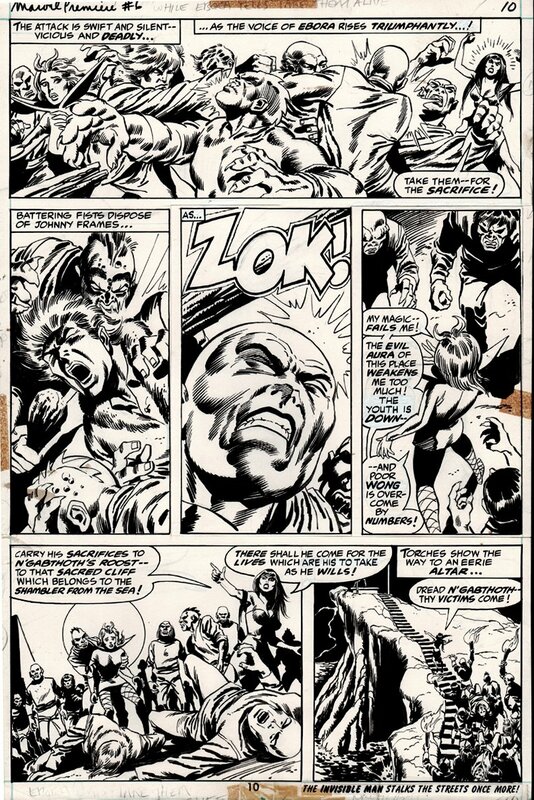 Overall, Brunner produced a small but highly impactful body of work for Marvel in the 1970s that has a loyal following among fans of original art. Brunner is best known for his work on Doctor Strange and for drawing the first four solo Howard the Duck stories. 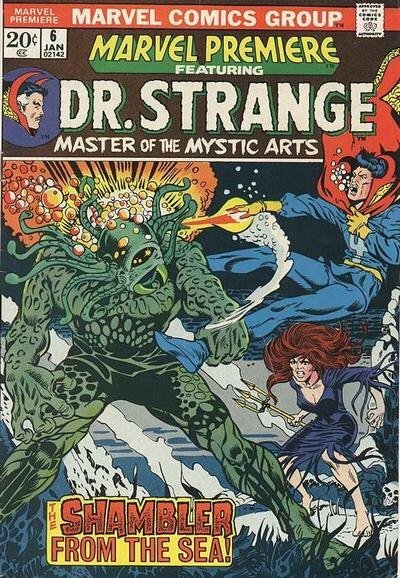 Brunner's style was perfectly suited to Doctor Strange's trippy adventures, and together with writer Steve Englehart, the pair took Doctor Strange to a new level that even Lee and Ditko, could not have imagined. ALL art on our website (including this one) are able to be purchased with VERY fair time payments, and trades are always considered towards "ANY" art on our website! Just send us an email to mikeburkey@aol.com and we can try to work something out.